First off, a little housekeeping; Warframe is currently in open beta, using the now standard but still technically incorrect definition of beta, meaning that it is not yet feature complete and, as such, game mechanics, mission content and other information may be subject to change. While one can argue that it is unfair to review a game that is still in beta, these days it has become so common for games to be ostensibly released while still under active development that sometimes you have to take a more flexible view on these things; Warframe is available on Steam (and not as part of their Early Access category) and you can spend real money in the in-game store and so, in our judgement, is suitable for review. With that out of the way, Space Ninjas! One of my major gripes with a lot of current-gen games is that they have become far too plodding, methodical and reliant on running between identical bits of cover to traverse their levels. This is partly due to the need for games to be manageable when playing with a controller and partly because who doesn’t love shoulder-high walls? Digital Extremes have taken the view that shoulder-high walls are for pussies and have created a game in which taking cover is something that you do only as a last resort and even then you still tend to do it while running at high speed. Warframe is a free-to-play online 3rd-person co-op shooter, which casts you as one of the Tenno who are mystical warriors that blah, blah, blah – you know how this works by now, the story really isn’t important here. As Tenno, you get to make use of the titular warframes, sort of Guyver-esque battle suits with a variety of stats and abilities, a large assortment of weapons and a penchant for running up and along walls. Following your initiation (tutorial), you are handed a basic pistol, rifle and sword and given the choice of one of three “starter” warframes tailored to different styles of play (Gunplay/Powers/Stealth), something that is currently a bit of a crap-shoot as you’re really not given sufficient information with which to make an informed choice. 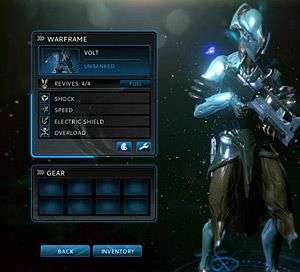 Each warframe comes with four different powers of varying utility and can make use of a variety of mods to enhance its abilities; mods and powers take the form of cards, which can be slotted into warframes and weapons. The game is set in our solar system at some unspecified point in the far future and missions take place in and around the major planets and other celestial bodies; these can be attempted solo or with up to three allies, with enemies doing a reasonable job of scaling to match. Completing missions gains you XP and credits, with both your warframe and weapons levelling up with use, increasing your health/shields/energy capacity and the number of mod/power cards you can equip at a time. I picked the Volt warframe to start with – pretty much at random, I have to say – which, it will surprise you to learn, is focused on electricity-based powers and has since been replaced in the starting line-up by Mag (and you’ll never guess what that powerset revolves around). Volt’s powers include a lightning bolt attack, a placeable electric shield, a speed boost and a top tier power called Overload that blows out all nearby lights and electronics, electrocuting any enemies within a sizeable radius. The problem is that even once you’ve levelled up to increase your maximum energy and have mods that reduce the energy cost of powers, they’re still very expensive meaning that you can’t really use them as much as you’d like and I’ve generally found myself artificially limiting their usage to when I get overwhelmed by enemies, otherwise there’s a good chance I won’t have any energy left when I need it as the energy drops are entirely random. On the subject of enemies, there are three different enemy factions at work in the Warframe universe (well, solar system anyway); the Grineer who are essentially angry, cloned humans in heavy armour, the Corpus who have lots of robots with shields, security cameras and annoying drones that drop mines everywhere, and the Infested who are your standard swarming, mutant, hive-mind sort of affair. One thing that is quite nice is that where more than one faction is present in a mission, they will fight with each other as well as with you, which is a pleasant change from the usual situation of otherwise sworn enemies playing nice whenever you’re around. Mission environments are randomly generated, but do have a fairly limited tile set, which means that you will quickly learn to recognise each area and the best way to approach them (and probably start to get a little bored of them shortly afterwards). That said, they do appear to be making a concerted effort to add more areas and map types in order to try and alleviate this problem. There are environmental hazards such as fire (burns you if you stand in it) and ice (reduces your shields, but also lets you slide around a lot), which, although they do impact your gameplay, get less and less noticeable as you increase in level. The one exception to this being the decompression hazards in some maps in which a stray bullet can puncture the outer hull of the ship and start sucking all of the air out of the room, giving you a fairly short time in which to locate and hack a control panel to seal the breach and re-open the bulkheads lest you suffocate. There are currently eight different core mission types, varying from assassinations to sabotage, hostage rescue to wave-based defence, and your objectives will often change dynamically as the mission progresses, which either adds a little variety or annoys the hell out of you, depending on the situation. On top of this, there are time-limited Alert missions that pop up semi-regularly and often grant special rewards such as weapon or warframe blueprints for completing them. New weapons and new warframes can be acquired either by spending Platinum – bought with real money, of course – at the in-game store or by gathering various kinds of salvage from missions, along with blueprints from bosses and alert missions, and then spending credits and waiting days (literally) to craft them. The latter option involves a lot of grinding for components and getting lucky with the PRNG as the drops are random, although there is an individual loot system, so at least you’re not fighting others for the same drops. You also have a limited number of warframe and weapon slots in your inventory, which can only be increased by spending Platinum, though you can sell unwanted gear to free up space. Graphically, Warframe isn’t going to blow anyone away, but there are plenty of nice fire and electrical effects, sparks, dynamic lighting and ragdoll physics as well as snow and other environmental effects on certain maps. It runs quite happily maxed out at 1600×1200 (I like 4:3 displays, get off my lawn) on my Nvidia 560Ti without any frame-rate issues, even with 30+ enemies and associated debris on screen, and, mercifully, has a substantial FoV slider for those who need it. On a few occasions I have noticed the Bloom getting rather out of hand leading to a near-whiteout effect in certain cases that can impact on your ability to play the game, but it’s not something I have been able to replicate reliably and it is a feature that you can turn off if need be. Where Warframe really shines is its movement; you are almost always moving, often running, you can jump, roll, slide, flip, run up walls, along walls, jump off walls, climb ledges and generally chain most of them together into some wonderfully free-flowing level traversal. Running and gunning is not only possible but an awful lot of fun, as is running and slashing, especially with some of the more melee-focused warframes. While the combat can take dives into the repetitive or frustrating at times, the variety of movement options helps to prevent boredom setting in too easily. It’s not all good however, as the interaction controls are somewhat less responsive, requiring you to be directly in front of the object and looking right at it, which can make things tricky when trying to revive fallen allies during combat or simply interact with control panels in a hurry. While the game has controller support, outside of missions the interface is very much designed with a keyboard and mouse in mind and would be a nightmare to try and navigate with an analog stick. 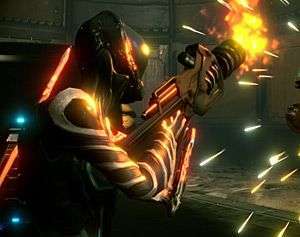 The problem with non-story-focused co-op games such as this is that you fairly quickly run out of new experiences for the player; while there are new weapons and new warframes to acquire, the AI doesn’t really have any clever new tricks to pull out of its hat like human players do and so there isn’t much that you have to adapt your playstyle to cope with as the game progresses. Furthermore, once you’ve completed all the missions – which is going to take you quite a while, there are over 200 plus Alerts – there isn’t really much more to do at the moment other than levelling up different warframes and different gear. 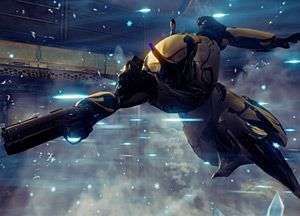 Combined with the relatively limited mission tileset, it does raise questions about the longevity of the game unless Digital Extremes can keep coming up with new ideas to extend the experience. Warframe is a fun and engaging 3rd-person shooter, which focuses on an enjoyable gameplay experience and avoids falling into the trap of trying to clone every other 3rd-person cover-examination sim out there. The level traversal and movement is very satisfying, and although the combat can degenerate into a bit of a slog at times it generally manages to keep you entertained. The graphics and audio are nothing to write home about, but they're perfectly serviceable and there's plenty of content to keep you going, even if it can get a bit samey at times. If you enjoy shooting things while running along walls, or like the sound of shooting things while running along walls, then I recommend you give Warframe a try; it's currently available for free from warframe.com and on Steam.